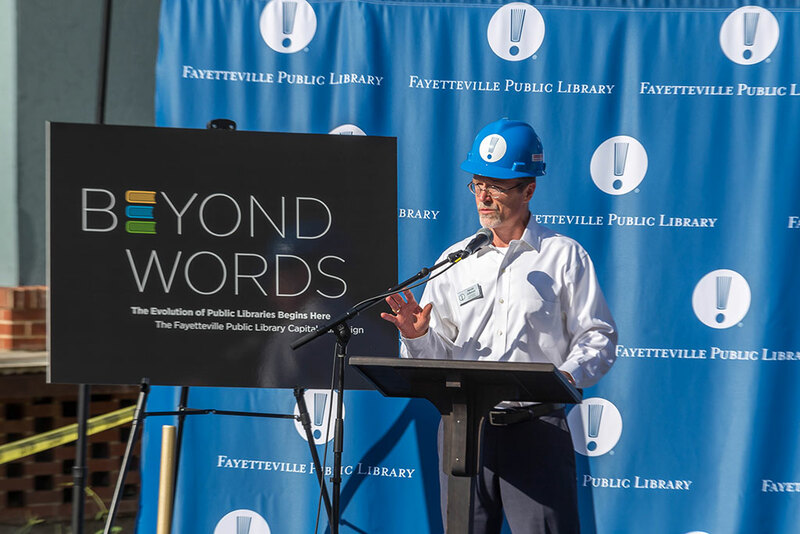 David Johnson, executive director of the Fayetteville Public Library, speaks Tuesday during a kickoff celebration for the expansion of the library. 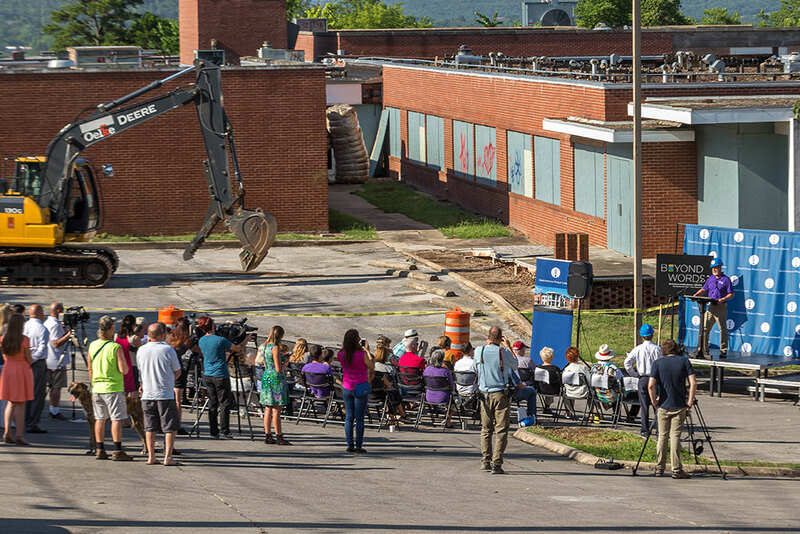 The first visible signs of a years-long project are now on display outside the Fayetteville Public Library. 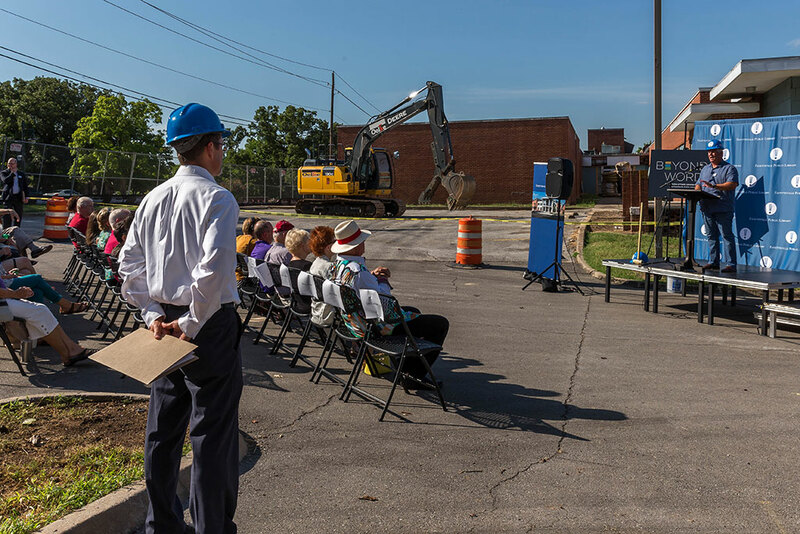 A kickoff celebration for the expansion of the facility on Tuesday culminated with the removal of a brick wall on the south side of the old City Hospital building, across the street from the library. 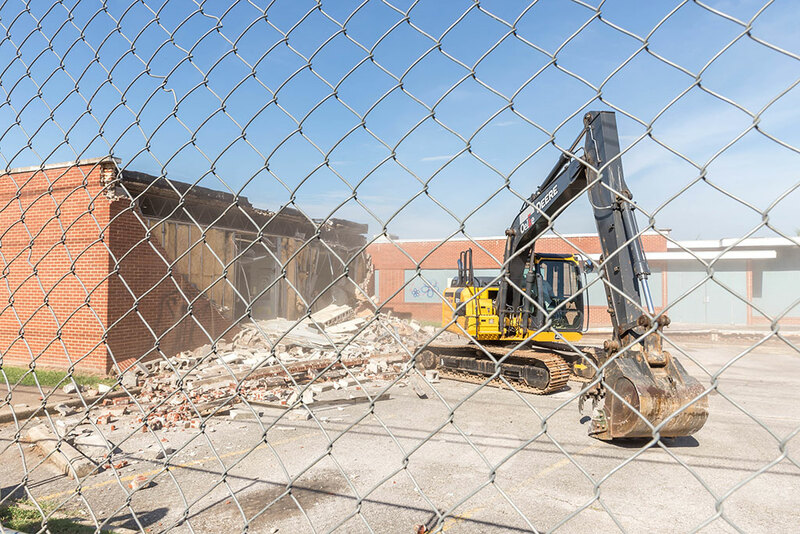 Crews will now begin a complete demolition of the former hospital property to make way for a massive expansion of the library. Once complete, the expanded library will include an innovation center with audio/video recording studio, virtual reality room, photography studio, and simulation lab, an expanded youth services area, a multipurpose center, along with additional meeting spaces, an outdoor courtyard with green spaces around the property, and other amenities. 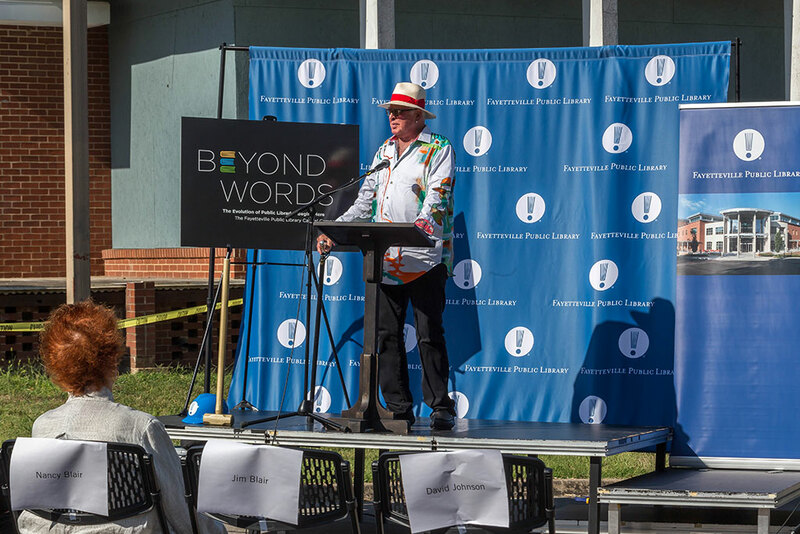 David Johnson, the library’s executive director, first revealed his desire to expand onto the former hospital property nearly five years ago. Johnson (left) listens as Mike Russell, president of the Fayetteville Public Library Foundation, speaks Tuesday. Johnson has said the expansion is not so much about adding more shelves for books, but rather adapting to a changing dynamic that is affecting libraries all over the country. For decades, Johnson said, libraries have had a singular purpose built around providing stacks of materials for people to check out and then return. Connecting people to knowledge, he said, has expanded far past just putting books into people’s hands. Johnson said the library sees about 185 visitors per hour, who are all there for a variety of activities, ranging from quiet reading, to attending packed-house guest speakers, to yoga classes and hands-on robotics training. “Our spaces can no longer accommodate the demand we’re experiencing on a day-to-day basis,” he said. Jim Blair speaks Tuesday morning. The library is named after Blair, whose donation helped fund the original facility, which opened in 2004. The Fayetteville library, which opened in 2004, was designed to be a 20-year building, but officials have said many times that it has already reached its capacity in almost every measure. Statistics have shown that the library has seen a 44 percent increase in circulation – almost half of which is youth services – since it opened in 2004. The city’s population, which was at about 64,000 when the current building opened, has increased to over 80,000 people and is expected to hit 115,000 by 2030. Officials have said the numbers alone – which show what could be a doubling of the city’s residents in the coming years – are a compelling enough reason for why an expansion is needed. The new facilities will extend south across Rock Street. 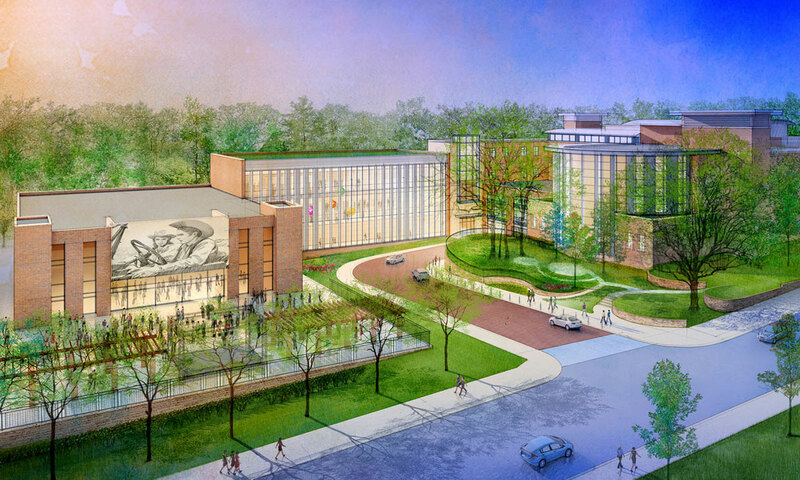 Early concepts show the addition of about 70,000 square feet of space and 115 parking spaces, nearly doubling the size of the current library and its parking capacity. Because of the elevation of the property and the envisioned design of the new buildings, the views of the mountains to the south will remain intact, architects have said. The new facility is also expected to build upon the current library’s focus on energy efficiency. The library last year finalized its purchase of the former hospital property from Washington Regional Medical Center following a court decision that settled a land dispute. The $2 million sale had been held up in court since descendants of the donors of the land first challenged the ownership. About a year earlier, Fayetteville voters approved a millage increase to help fund the library expansion. The measure passed 59 percent to 41 percent. The library’s 1-mill property tax was then increased to 3.7 mills. 1.2 mills was allocated for construction bonds and 1.5 mills will be used for operating costs. Once the construction bonds are paid off, the tax will be lowered to 2.5 mills. The millage increase will provide about $26.5 million for the expansion. Officials hope to raise another $22.8 million in donations to complete the project. Crossland Construction and architecture firm Meyer, Scherer & Rockcastle are in charge of the expansion project. Both companies were involved with the original Blair Library construction in 2004. Demolition is expected to last about three months. Grading and site preparation will come after that with construction beginning in early 2019. If all goes according to plan, the new facility should open sometime in mid-2020.